Charles Turner, author of Clemency: The Saint Chronicles, Part1 was born in Winchester, Virginia. He attended grade School at The Hill School, Middleburg Virginia and entered an all-boys Episcopalian boarding school near Hagerstown, Maryland in the fall of 1979. There, he played Varsity Soccer, was an acolyte in the Chapel, and in his senior year was voted as one of 12 Prefects and one of 6 hall monitors in a dorm on Campus. He graduated with honors and went on to Randolph-Macon College in the September of 1982. Charles concentrated his efforts on two areas of study in College: English and Computer Science. Before his graduation in 1986, he was offered and accepted a position as Legislative Assistant to Congressman D. French Slaughter, Jr., and went to work on Capitol Hill one week after commencement exercises. On the Hill, his legislative emphasis centered on matters related to Defense, Energy, Environment and Science and Technology where he served as a staffer for the committee. This opened the door to working with the U.S. Space program, NASA and a broad range of other space, defense and technical programs being focused on in Washington, DC at the time. In 1988, Charles left Capitol Hill, and took a position with a firm in Northern Virginia that provided computer services to Congressional and Senate offices. There, he started out in Customer Service but quickly moved into the engineering department where his skills as a programmer were tapped to create the next generation of hardware and software designed to serve the Hill. Ultimately he was hired by a Washington, DC based consulting firm to work as a contractor for the Federal Government, again focused on his skills as a programmer and his strengths in writing. This position offered a wide array of projects across multiple government agencies. This work continued until the fall of 1992 when personal tragedy struck. Charles’ father had his first stroke. This brought Charles out of Washington, DC to help run the family business while his father recovered. As complications continued, Charles left Washington all together to focus on the business. While he ran the business for ten years, he never lost his interest in his prior work. As such, he continued to work on multiple projects over the next decade. In 2002, the family business was sold and Charles went into Real Estate. This gave him the flexibility to re-ignite his prior working relationships, and to pursue his prior interests, as well. He went on to become a PADI Certified Assistant Instructor, with more than a dozen specialties, and an emphasis on re-breather diving. He also would go on to get his Private Pilot, Instrument Pilot, Commercial Pilot and Ground Instructor ratings in both single and multi-engine aircraft. It was at this point that he turned to his writing. As an author, Charles Turner writes almost exclusively from his personal passions and experience to add realism to his work, and enjoys living quietly with his family on a farm that has been in his family since the Revolutionary War, in Virginia’s Hunt Country. Most would find Charles to be outgoing, gregarious, easily approachable, friendly and a good speaker who sits well in an interview. He has a deep nature, and tends to deal with broad and deep concepts in his writing. While not overtly religious, he does recognize religion as a driving force in our lives. He loves all things that are nature and the outdoors, man and invention, and experiences that elevate us through defining moments. This is well reflected in his hobbies, professional experience and his writing as a whole. 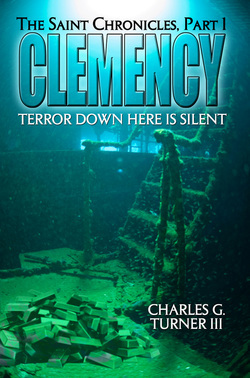 Clemency is the story of three unsuspecting friends who, as a result of their complex circumstances, are hired by bereaved families to salvage the bodies of their dead sons from a shipwreck which is at perilous depths out in the North Atlantic. Forced together for the mission, with the promise of a better life waiting at the end, they take on the task. But without all the details, they find themselves wound inextricably into something as ddangerous on land as it would be at the frigid depths. What they thought would be an extremely dangerous but relatively straightforward affair turns out to be a complex and twisted undertaking involving betrayal, greed, revenge, and murder.